My crazy Wilderness Heals filled week. First of all, a huge thank you to Erika Whyte for covering for me last week! 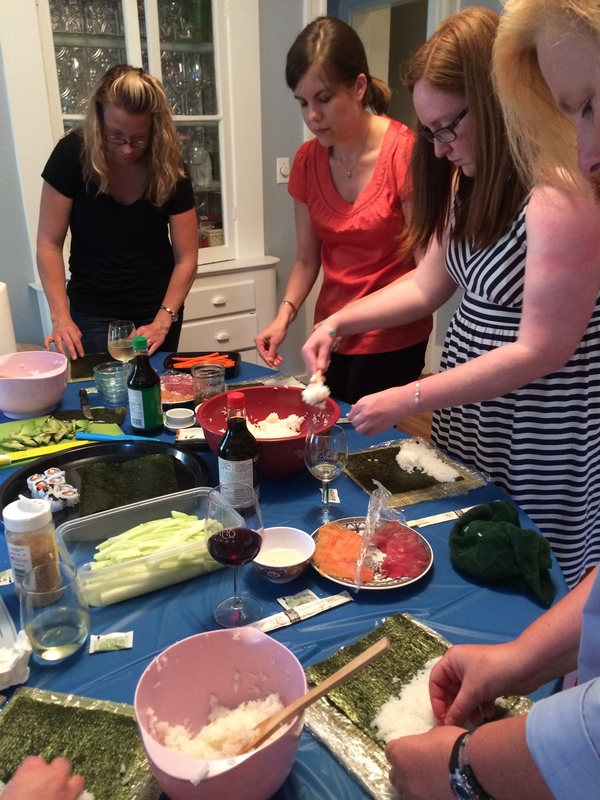 Last week was a crazy one, as I hosted a Sushi Making Class Fundraiser and lead two training hikes! I was one busy woman! But, now I get to tell you about my wonderful, crazy week. I have also recommended previously to find a skill you have and use it to help you fundraise. 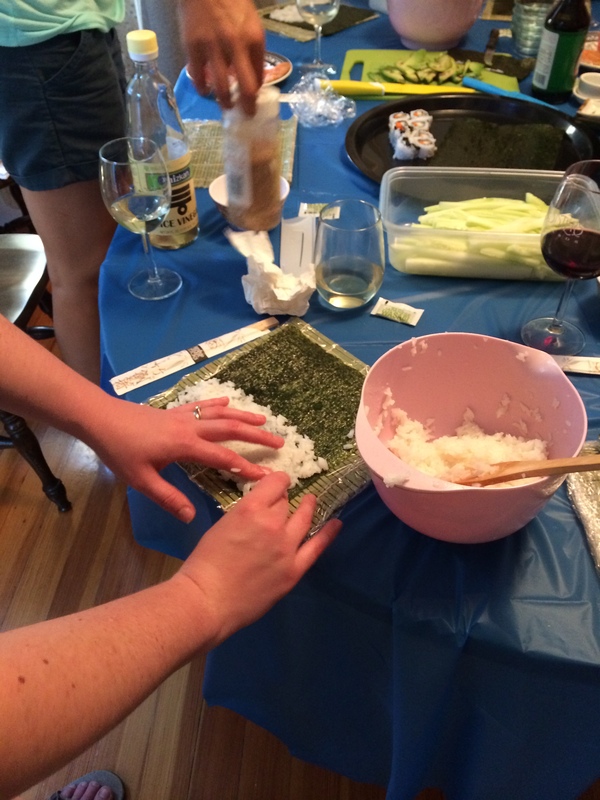 In this case, I had had one experience rolling sushi, but I called in my good friend, Shauna Campbell to be the real teacher. This was great because she was willing to donate her time and so the class part of it cost me nothing. 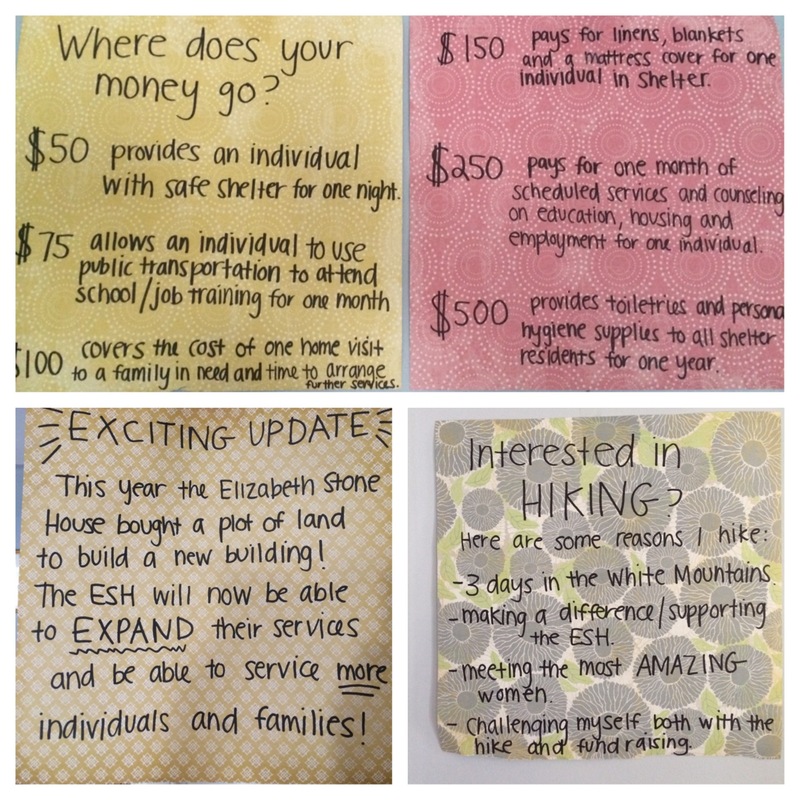 All I needed to do was put in some time grocery shopping and chopping/prepping food for the evening and make sure my class fee covered the supplies and made money for the Stone House. This was definitely one of my more pricier fundraisers (as I pride myself in trying to find ways to spend the least amount of money to make the most amount of money) but it was such a fun theme and I had Shauna donating her time, that it was totally worth it and I think all the sushi students thoroughly agree! 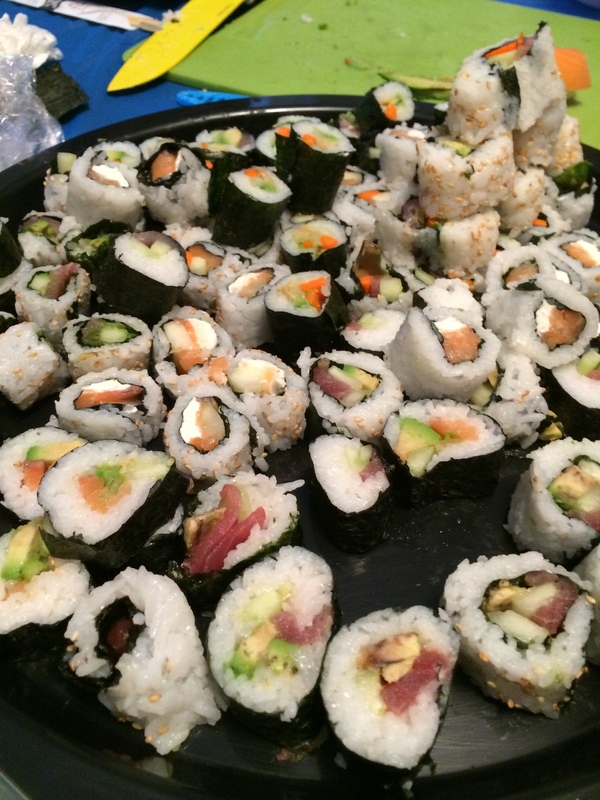 A BIG thank you to all the people who participated in the sushi class fundraiser! Your donations, great energy, and awesome sushi skills were amazing! It all started Friday night packing my backpack making sure I had all the food, supplies and clothes I needed for the weekend. 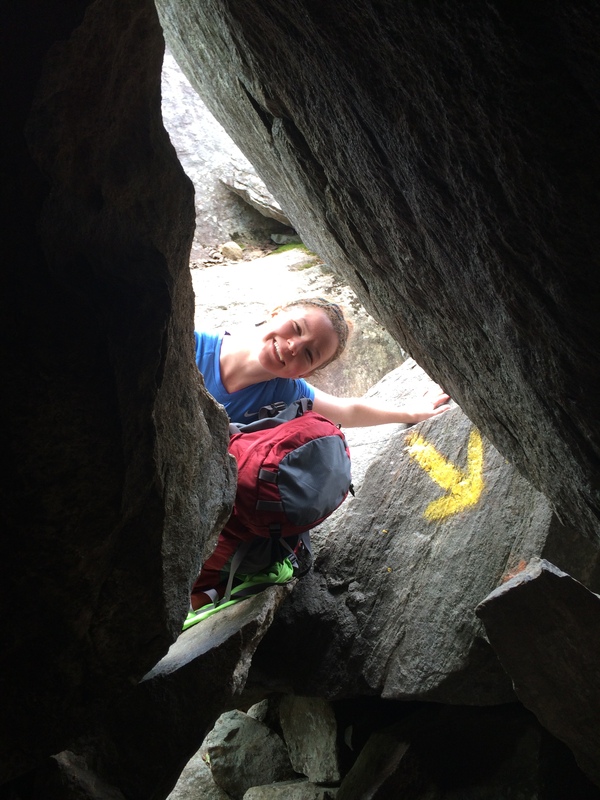 Katie Kozin and I both lead two training hikes this past weekend, the Hancock Loop on Saturday and Mount Percival and Mount Morgan Loop on Sunday. We had an awesome crew, five including us team leaders on Saturday and then we all camped overnight at Hancock Campground and were joined my two more hikers on Sunday’s hike! The Hancock loop was a long strenuous 9.8 mile hike with some very steep sections. We had a wonderful view on Hancock where we sat and ate our lunch before heading over to South Hancock. The ridge in between Hancock and South Hancock was a nice wooded area with rolling hills, which always is my favorite (and my leg’s favorite too!). After the long hike, the five of us headed to Hancock Campground where we were so lucky to get the LAST campsite available. We set up our tents and headed out to dinner, probably our single best plan of the entire weekend. I think if we had needed to cook our own dinner, I would have skipped and just went to bed hahah. So we grabbed dinner at the Woodstock Inn in North Woodstock, NH and had a yummy dinner. After dinner, we promptly went to bed at 8:30 pm and had a good sleep before we needed to get up early once again on Sunday. In the morning, we packed our things and headed down to Mount Percival Trail which is about a 45 mins drive south from Hancock Campground. We met up with two new Wilderness Heals hikers, Eileen Flanagan and Mairead Helmes and were ready for another day of hiking. The Mount Percival/Morgan loop was a moderate hike that was 5.6 miles and had some amazing views. An easily overlooked hike, especially if you are one of those 4,000 footer list hikers, as Mount Percival and Morgan are a bit over 2,000 feet in elevation. We climbed Mount Percival first and some of us needed to warm up our bodies after feeling tired from the day before and our two new hikers had a fresh set of legs and were cruising along. We then were only .1 miles to the top and it splits so you can go by way of the cliffs or the boulder caves.. 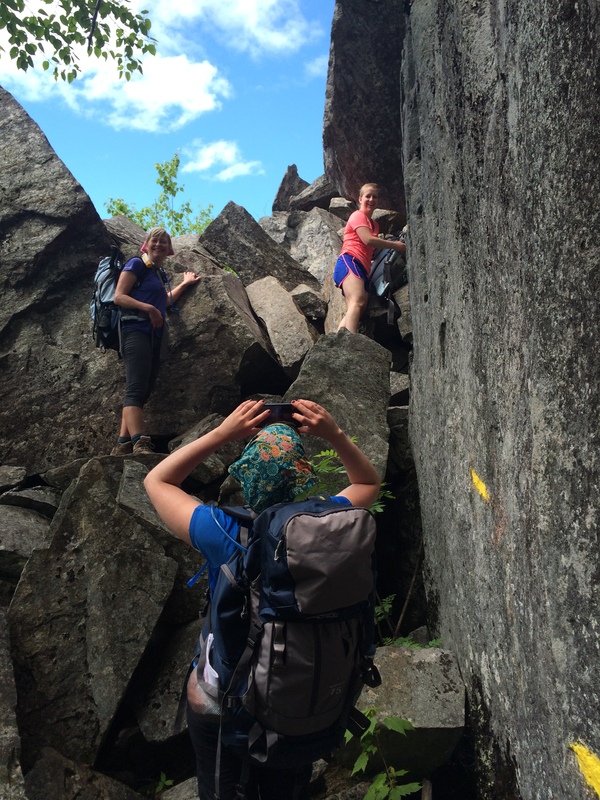 Even though the boulder caves are tougher, we decided it would be fun to check them out! This .1 miles took awhile but it was totally worth it. We helped each person get their pack through small holes and help them adjust to wiggle their body through the holes, but it offered lots of “Facebook profile picture moments” and was well worth the extra work. We ate our lunch on the top of Mount Percival before heading along the ridge to Mount Morgan. 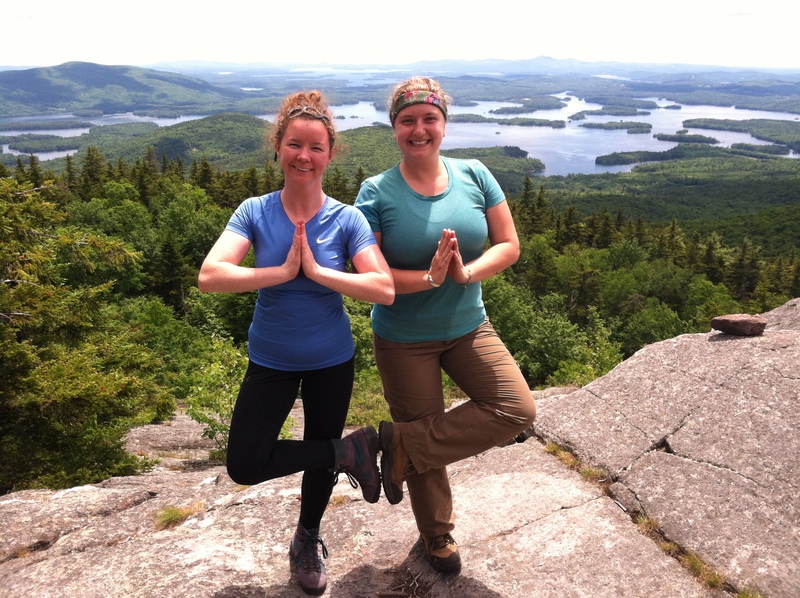 Mount Morgan had matching stunning views of Squam Lake and we spent of a bit of time snacking and taking yoga pose pictures at the top. Lastly, we headed down the mountain where we had more time to learn about the other hikers in our group and took an easy to moderate descent. The whole weekend went super well and I think all of the hikers enjoyed themselves. We had a tough hike on Saturday and a moderate hike on Sunday but got to enjoy some amazing views throughout the weekend. Quick reminder: This is the last weekend for training hikes and you must sign up with the team leader by today if you plan to attend! 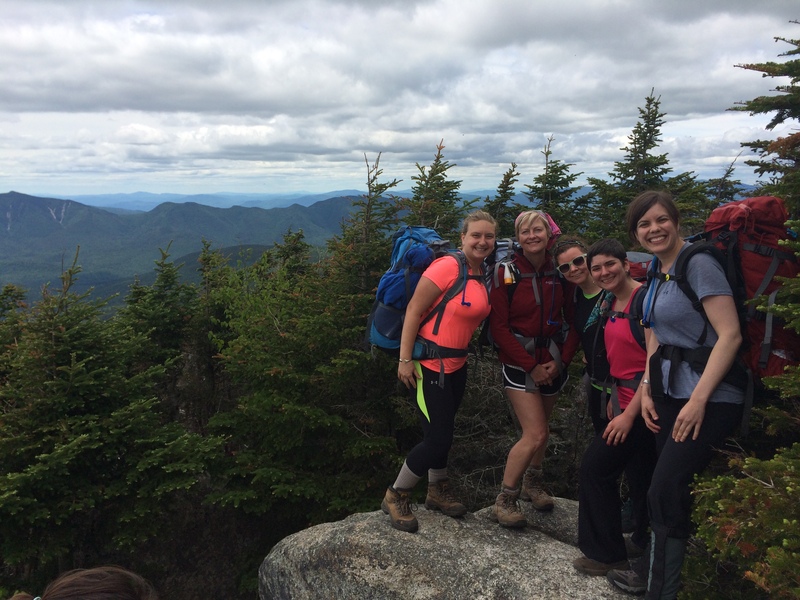 To participate in the three-day event, you must have done at least one training hike. How have your training hikes been?